(from Wikipedia, the free encyclopedia) The third generation Corvette, patterned after the Mako Shark II concept car, was introduced for the 1968 model year and lasted until 1982. C3 coupes featured the first use of T-top removable roof panels and were sold in record numbers despite changes due to EPA regulations and the gas crisis of the 1970s. It introduced monikers that were later revived, such as LT-1, ZR-1, and Collector Edition. The Corvette's 25th anniversary was celebrated in 1978 with a two-tone Silver Anniversary Edition and an Indy Pace Car replica edition. It was the first time that a Corvette was used as a Pace Car for the Indianapolis 500. Engines and chassis components were mostly carried over from the C2, but the body and interior were new. The 350 cu in (5.7 L) engine replaced the 327 cu in (5.36 L) as the base engine in 1969, but power remained at 300 bhp (224 kW). 1969 was the only year for a C3 to optionally offer either a factory installed side exhaust, or the all-aluminum ZL1 427 cu in (7.00 L); The special big-block engine was listed at 430-hp (320 kW), but was reported to produce 560 horsepower (420 kW) and propelled a ZL1 through the 1/4 mile in 10.89 seconds. Due to an extended production run for the 1969 model year due to a lengthy labor strike, sales were down on the 1970 models to 17,316. 1970 small-block power peaked with the optional high compression, high-revving LT-1 which produced 370 bhp (276 kW). The 427 big-block was enlarged to 454 cu in (7.44 L) with a 390 bhp (291 kW) rating. The ZR-1 special package was an option available on the 1970 through 1972 model years, and included the LT-1 engine combined with special racing equipment. Only 53 ZR-1's were built. The 427 cu in (7.00 L) big-block was enlarged to 454 cu in (7.44 L). In 1971, to accommodate regular low-lead fuel with lower anti-knock properties, the engine compression ratios were lowered which resulted in reduced power ratings. The power rating for the 350 cu in (5.7 L) L48 base engine decreased from 300 to 270 horsepower and the optional special high performance LT1 engine decreased from 370 to 330 horsepower. The big-block LS6 454 was excluded from the de-ratings and it reached its power peak of 425 bhp (317 kW). For the 1972 model year, GM moved to the SAE Net measurement which resulted in further reduced, but more realistic power ratings than the previous SAE Gross standard. Although the 1972 model's 350 cu in (5.7 L) horsepower was actually the same as that for the 1971 model year, the lower net horsepower numbers were used instead of gross horsepower. The L48 base engine was now rated at 200 bhp (150 kW) and the optional LT1 engine was now rated at 270 bhp (200 kW). 1974 models had the last true dual exhaust system which was dropped on the 1975 models with the introduction of the federally mandated catalytic converter and mandatory use of no-lead fuel. As a result, engine power plummeted with the base ZQ3 engine producing just 165 bhp (123 kW), the optional L82's output was reduced to 205 bhp (153 kW), and the 454 big-block engine was discontinued. Gradual power increases after 1975 peaked with the 1980 model's optional L82 producing 230 bhp (172 kW). Styling changed subtly over the generation until 1978 for the car's 25th anniversary. 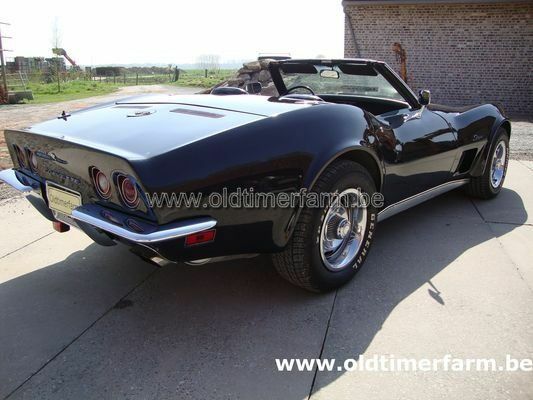 The Sting Ray nameplate was not used on the 1968 model but Chevrolet still referred to the Corvette as a Sting Ray, and 1969 (through 1976) models used the "Stingray" name as one word, without the space. In 1970 the body design was updated including fender flares, and interiors were refined including redesigned seats. 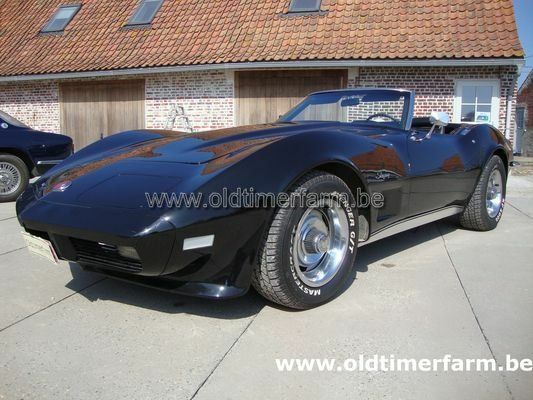 Due to the government regulation, the 1973 Corvette's chrome front bumper was changed to a 5-mile-per-hour (8 km/h) system with a urethane bumper cover. The optional wire-spoked wheel covers (left) were offered for the last time in 1973. In 1974 a 5-mile-per-hour (8 km/h) rear bumper system with a two-piece, tapering urethane bumper cover replaced the Kamm-tail and chrome bumper blades, and matched the new front design from the previous year. 1975 was the last year for the convertible, (which did not return for 11 years) and Dave McLellan succeeded Zora Arkus-Duntov as the Corvette's Chief Engineer. For the 1976 models the fiberglass floor was replaced with steel panels to provide protection from the catalytic converter's high operating temperature and the Stingray nameplate was dropped after 1976 ending 13 model years where the names Corvette, Sting Ray, and Stingray were synonymous. 1977 was last year the tunneled roof treatment with vertical back window was used, in addition leather seats were available at no additional cost for the first time. The black exterior color returned after a six-year absence. The 1978 model introduced the fastback glass rear window and featured a new interior and dashboard. Corvette's 25th anniversary was celebrated with the Indy 500 Pace Car limited edition and a Silver Anniversary model featuring silver over gray lower body paint. All 1979 models featured the previous year's pace car interior and offered the front and rear spoilers as optional equipment. In 1980, the Corvette received an integrated aerodynamic redesign that resulted in a significant reduction in drag. After several years of weight increases, 1980 Corvettes were lighter as engineers trimmed both body and chassis weight. In mid-1981 production shifted from St. Louis, Missouri to Bowling Green, Kentucky, and several two-tone paint options were offered. 1981 models were the last available with a manual transmission until well into the 1984 production run. In 1982 a fuel-injected engine returned, and a final C3 tribute Collectors Edition featured an exclusive, opening rear window hatch. Specifications. Body : length/width/height/wheelbase – cm (in) : 464/175/121/249 (182.5/69/47.8/98); weight : 1499 kg (3305 lb). Engine : front V8 5733 cc (350 ci), automatic 3-speed gearbox, rear-wheel drive. Maximum power : 202 bhp @ 4400 rpm; maximum torque : 407 Nm @ 2800 rpm. Top speed : 210 km/h (130 mph).